Grade: Primary and Slow Learners Language Skill: Reading. Picture/Story Cards Method: My children are very poor in English and it was quite difficult to develop reading skills with them. They couldn't even understand simple stories without me translating into the mother tongue. So, to reduce the reading burden and help them understand, I prepared picture or story cards for every lesson. I turned each story into a picture story by preparing picture cards for every sentence in the story. The cards illustrated the contextual meaning of each sentence and key vocabulary, so if a story had 30 sentences, I prepared 30 pictures based on the keywords in each sentence. Then I began telling the stories using these pictures. Grade: 2 Language Skills Focused: Speaking, Reading and Writing. An interactive teaching material will always leads to great output in teaching. Children in early school days they love to learn in play way method. So as a teacher we should prepare such innovative or interactive TLM regarding the content. I was very happy to share my children responses because I didn't expect my learning strategies will lead to achieve such objectives. I planned this lesson using some picture cards. I acted like these animals what they can do during the lesson. And asked my children to imitate like me. Once they were confident with oral responses I guided them to write on paper. 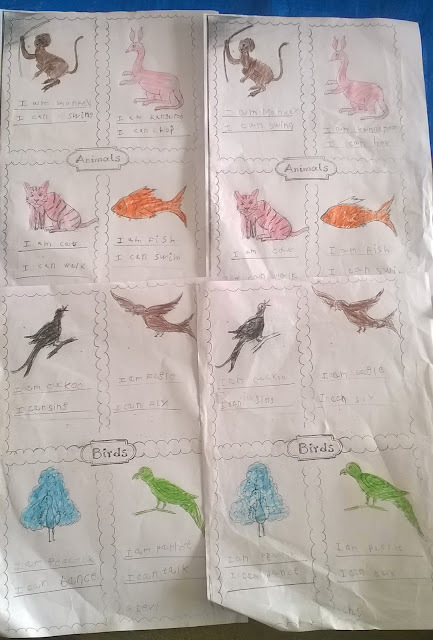 I prepared a worksheet to colour and write about abilities of those animals.